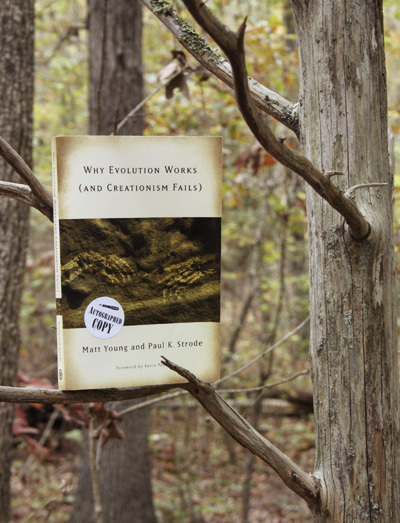 Why Evolution Works (and Creationism Fails), by Matt Young and Paul K. Strode, was written in response to a determined movement solely by religious organizations to discredit a fundamental tenet of science and biology: evolution. Or to be more specific, the theory of descent with modification by natural selection. And that is the only place where resistance comes from. There are only a tiny percentage of biologists that question the theory at all, and absolutely none that I have determined that somehow do not work religion into the discussion. This by itself bears some examination, since there is little religious effort put into discrediting geology, cosmology, thermodynamics, or history, all of which present us with hard evidence that scripture is wildly inaccurate. There seems to be something about evolution, most especially human evolution, that really annoys the hell out of many religious folk, so much so that it requires obvious and coordinated efforts to demean. As Strode and Young demonstrate, however, there isn’t a rational argument against evolution at all. Science has a very distinct method of ensuring accuracy, and this does sometimes mean that theories are refined as we get better information – refinement, however, is not the same as eradicating or replacing, and the fundamental aspect of descent with modification not only has not changed in the time since it was proposed, it has actually been strengthened by this new information, so much so that no one who understands it seriously questions it in the slightest. Religious arguments often involve the idea that science changes, as opposed to (supposedly) perpetual scripture, but this should actually be expected. Humans are not perfect nor omniscient, so our knowledge base will naturally grow, and the ability to change and correct ourselves is how progress is defined. It is similar, in many ways, to a murder mystery, but in real life there is rarely a j’accuse that wraps everything up; instead, we have only the weight of the evidence to go on, and given enough evidence, one is left with the difficult proposal of explaining how any other conclusion could result in the, literally, hundreds of thousands of clues we have. Young and Strode lay out the case, building on it with each successive chapter, taking the time to establish why there is so much support for this mere theory (and of course, debunking the hoary old “it’s just a theory” meme as they do so.) Each chapter deals with a different aspect of the discussion in detail, simultaneously showing both the support for evolution and the weaknesses behind the opposing arguments. I feel obligated to point out that this is not an anti-religion or atheist book (leave that to me,) but deals solely with evolution. To their credit, they not only say they are not addressing religion as a whole, but feature two religious authors with their own discussion against the inerrancy of scripture, perhaps the biggest issue brought up in opposition to evolution. Strode and Young are conscientious enough to differentiate “creationism” from “religion,” and deal only with that which tries to dismiss or deride evolution. Initially, I had some misgivings about this book based on the title, since I felt that the target audience, those who feel evolution is untrue, would specifically avoid the book because of it. Not far into the book, however, I corrected that: it’s aimed more at those who have to debate this issue themselves, such as educators, and alternately for those who have heard arguments in both directions and want a better understanding. To that end, it provides an excellent example of building the case. It shows the functional attributes of the scientific method, specifics pertaining to Darwin’s original theory and the later refinements from genetics, the flaws of the opposing arguments and the nature of pseudoscience, and even includes essay questions at the end of every chapter – these are not aimed at reviewing the material, but to encourage the application of the thought processes towards deeper understanding. While the material within the book is accessible to any adult, or even young-adult, the questions reflect college-level exercises intended to evaluate content rather than regurgitate it. It could almost serve as a textbook, though it would be hard to justify a course with the goal of trashing an approach, even one as untenable as creationism. There are those who will not be reached by the material, to be sure, but this book isn’t targeted at blind faith; it is instead aimed at those willing to discuss issues and weigh evidence fairly and openly. 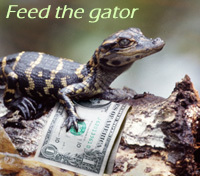 In a few places I found some points that could have borne greater detail or support, since I recognize the kind of opportunities creationists look for to drive some doubt into the discussion. These were outweighed by the detailed examples in opposition to the common arguments, examples such as the unintelligent design of the human knee, and the differences between morphological (appearance-based) and molecular (gene-based) phylogenetic trees, better known as “family trees.” One gets a necessary glimpse into the incredibly involved world of biology, and is reminded that evolution isn’t some casual talking point, but remains wrapped inescapably within a body of knowledge that simply wouldn’t work at all without it. It’s easy to say, “the vast majority of scientists accept evolution,” but another to show that decades of research and medical understanding would be totally dysfunctional in its absence. One cannot simply make up a detailed theory and have tens of thousands of scientists working in the field never realize it, and this book provides some recognition of such a ludicrous idea. Without once, I should add, coming out and saying how ludicrous such ideas are. For the individual interested in understanding more about evolution itself, this book provides a basis, but lacks the detail that it should have for that goal. Since it is not aimed at that, but rather at those engaged in the debate between evolution and creationist/religious arguments, it serves its purpose well, and includes copious notes and a complete glossary and index. The science teacher who gets too many of those “challenging” questions their students have been primed by their churches to ask would be well served to keep this handy – initially, I was going to say, “well out of sight in a drawer,” but then considered that having it out in the open provides more chances for students to thumb through it on their own. The book is also useful to those who accept evolution with little reserve, but find themselves ill-equipped to debate it effectively. It not only deals directly with the evolution/creation issues, but also with some of the more common fallacies and misleading approaches that invariably crop up, and prepares the reader well for the creationist who resorts to switching tactics when their first arguments fail. In this way, it is more valuable than simply knowing evolution well, since many of the arguments deal with unrelated subjects like probability and cosmology, also addressed by Young and Strode. Subtly, this is damning by itself, since it becomes clear that creationists rely heavily on the misrepresentation of science in as many areas as possible. It is hard to believe that so many “innocent” misunderstandings could exist, and continue to exist – and of course, they don’t. The fact that such a book needed to be written shows us that religion, contrary to the assertions of many, is not about providing answers. When I took the photo for my last book review, I discovered that too few people noticed the inclusion of a vague human shape in the dark background that I had taken pains to capture, so I went for a more obvious thematic setting when composing the accompanying photo.